Davis Guggenheim’s 2006 Oscar winning hit An Inconvenient Truth, is hugely praised for it’s role in raising awareness about climate change. The film follows former US Vice President Al Gore informing and educating US citizens about climate change, at a time when climate scepticism was rife in the US, due largely to President George W. Bush anti climate agenda. Then came the 2009 climate talks in Copenhagen and a genuine optimism that a global deal on climate change would be achieved. Climate activists from around the globe had travelled there to take part in the largest climate march ever and world leaders were in attendance, including the newly elected US President Barack Obama, UK Prime Minister Gordon Brown and the Russian President Vladimir Putin. As we now know, we never got a global deal on climate change; the Copenhagen summit was deemed a massive fiasco, the urgency in dealing with climate change dropped to an all time low, climate campaigning groups and news coverage dropped to pre 2006 levels. Barack Obama, who had made tackling climate change one of his top three election commitments when elected as President in 2008, was advised not to mention climate change. However we’re witnessing a new resurgence in interest in the subject, fuelled in part by developments such as a surge in extreme weather events being linked to climate change and the rise in extreme fossil fuel extraction such as tar sands, fracking and drilling for oil in the Arctic. Media too is pressing the agenda, increasingly re-examining the greedy nature of the fossil fuels companies via great investigate journalism from the likes of the Guardian, Huffington Post, Democracy Now, Grist, ThinkProgress and more. Obama is now talking about climate change with urgency again, and campaign groups such as Greenpeace, Sierra Club and 350 have also re-energised their campaign activities around the issue. The optimism surrounding growth and affordability of clean energy technologies like solar and wind is catching on; new clean energy records are being set month on month, and the US is now installing more clean energy capacity than fossil fuel capacity. But the climate debate is still the victim of misinformation about climate change, mainly due to conservatives forces such as the Heartland Institute and the Global Warming Policy Foundation think tanks. News organisations being funded by the fossil fuel industry, such as Fox News, accept large donations from the oil gas and coal industry to avoid coverage on climate change, as do many right wing politicians. But could a new high profile US blockbuster screened by the cable network Showtime be about to change this? 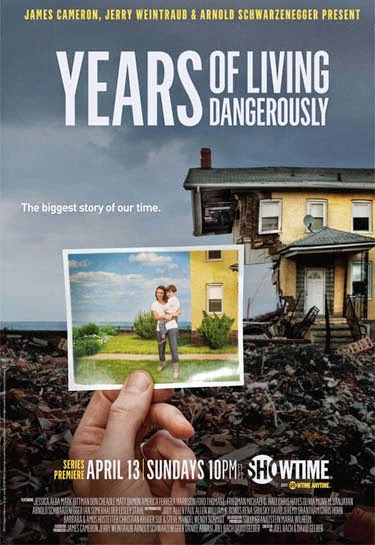 The documentary series Years of Living Dangerously premiered on the Premier US cable network on Sunday evening, showcasing a variety of high profile individuals examining some of the key issues around climate change and what is being done to combat it. The film director James Cameron, who gave us Titanic and Avatar, is just one a string of well known Hollywood names connected to the project. As an Executive Producer he joins the likes of Harrison Ford, Ian Somerhalder, Don Cheadle, Matt Damon, Arnold Schwarzenegger and many others as investigative field reporters on the issue. Well known climate scientists such as Michael E. Mann and Katharine Hayhoe provide the scientific background. In the first episode, available on YouTube (see above), we follow Harrison Ford as he travels to Indonesia to investigate the cause of the rapid deforestation in Borneo causing enormous loss of habitat and carbon emissions. Following this, New York Times journalist Thomas Friedman travels to Syria to investigate whether the Syrian war was in fact sparked off by a four year drought, which could be attributed to climate change. In Texas, Don Cheadle meet climate scientist Katharine Hayhoe, who as a devout Christian is making it her task to educate people that they can believe in climate change and God at the same time. Even though this is a US produced show, it has global importance. The makers of Years of Living Dangerously are trying to do what many politicians have so far failed to achieve; making climate change a global issue. This could be the most important mainstream TV series produced on the issue for decades; with it’s long list of Hollywood a-list stars it has the potential to attract new audiences to the cause, something the movement has dire need for.